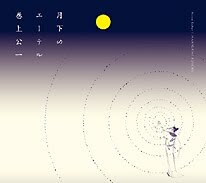 This week, Hikashu will set off a four-cities tour. The band has just recorded some new materials in New York City, and we could expect some of them will be performed in this tour, for the first time in public. Shinohara Tomoe and Steve Eto, the guests for the NYC gig, will be back for the Tokyo concert on June 2, 2011. Update: Time Out Japan recommends the Tokyo concert. The article is here. They says that "Hikashu really deserve to be a lot better known." Yes indeed. Hikashu in New York City on May 13, 2011. The red-yellow badge in front of the theremin says, "Nuke Power? No Thanks." 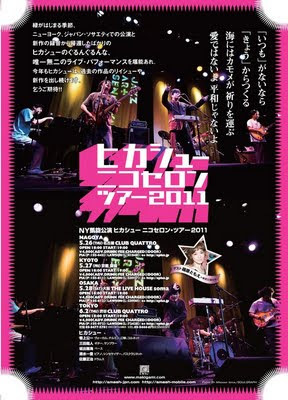 Downtown Music Gallery (website), the record store for connoiseurs in Manhattan, has released a photo collection of the Hikashu concert in New York City on May 13, 2011. It's huge - over 300 photos. The Photo Collection of Hikashu in New York City, May 13, 2011. Also, A/B series (website), the organization presented an A Я concert in Ottawa, put some photos and video clips on line from the performance. 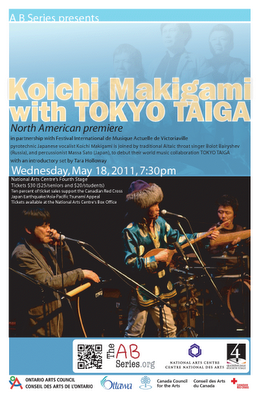 A Я, "world music power trio" consisted of Makigami, Bolot Bairyshev and Sato Masaharu, is now visiting Canada. AB Series, the venue in Ottawa, prepared a video trailer for the concert. The soundtrack is "Ano Sora" from "Tokyo Taiga" CD. Meet les trois messieurs and experience the otherworldly music from Asia! The today's morning edition of Shizuoka Shimbun (wikipedia), a daily newspaper, carries an article about Makigami Koichi, regarding throat singing and his activities in Tuva. The website of the paper has also the related videos of him as follows. Makigami strumming a Typshool, string instrument from Tuva, and practicing throat singing. From his latest visit in Tuva, a week after the earthquake. The first song is a cover of "Koi No Vacance" ("Vacances de l'Amour") by the Peanuts (wikipedia), the big hit of 1963. It's also a very popular tune in Russia. The Peanuts singing "Koi No Vacance," NHK-TV, 1965. A duo of Makigami and Onder Mongun-ool followed (the longer version is here), and "Sakura Sakura," the Japanese folk song (wikipedia), performed by Makigami, Yanagiya Koharu on shamisen, and Shika Udai on cello. "Sakura Sakura" by Hibari Children Choir. "Sakura Variation" for three kotos, one of the most popular interpretation of the song, arranged by Miyagi Michio (wikipedia), 1961. They played to sold-out crowd and the response was enthusiastic. 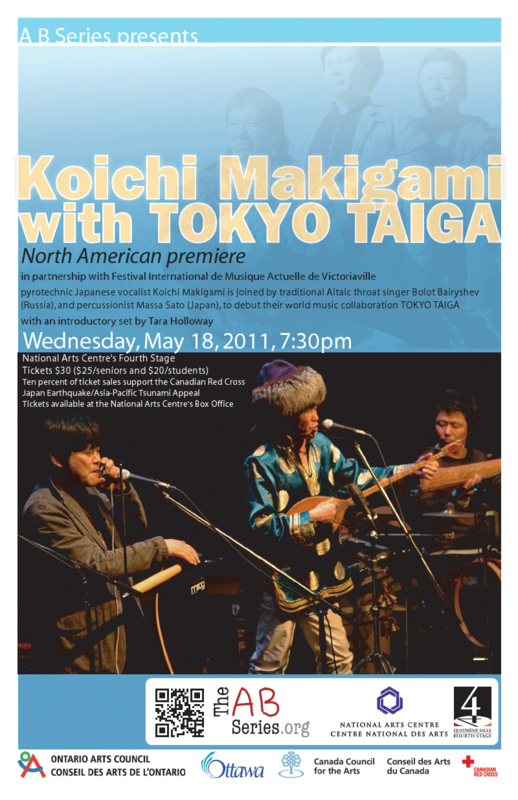 Unfortunately, that was the only US date but the Canadian tour of Makigami's group AR will soon follow. The band will spend a few days in the city and plans to record some material for new album. Go see them and show your support! There are special guests for the upcoming NYC gig - Shinohara Tomoe and Steve Eto. Though both they have a long career as performer, it is the first time they perform with Hikashu in public. Her profile is already mentioned on the Japan Society notification so here I'll write about her connection with Hikashu. Now she regularly attended their concert in Tokyo area and also befriended with the members. Then she was offered for the gig and graciously accepted. Shinohara and the Hikashu members, after a concert in Shibuya, 2010. Shinohara and Hikashu at rehearsal for the NYC gig, April 2011. A veteran percussionist and a member of Demi Semi Quaver, experimental rock combo with a distinctive vocalist Emi Ereonola. He's been very active as a session musician and a solo performer for years. He's also an eminent improviser and you could see him improvising on the video follows. Makigami recently uploaded a video of Nyunen (Deliberate) on YouTube. It is the single version, released in 2007. Actually, it was very old song, already performed at gigs in mid 1990s as far as back. Encouraged by positive feedback of the audiences, the band made several attempts to capture it in studio with different personnels. And finally, they completed it and released as single. It was also on their 2008 album called Ikirukoto with different take. With its philosophical lyrics, manic rhythm and attactive hooks, the song has been played regularly at gigs for years and becomes a crowd-pleaser now. The single is available worldwide via HMV Japan. 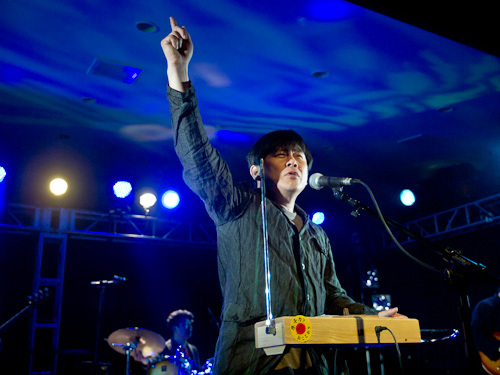 Just recently the examiner.com (wikipedia) published an article about the upcoming NYC gig of Hikashu, and surprisingly, this humble blog got mentioned in it. First of all, I just want to say thanks for the author. It gives the band more exposure in media, and regarding this blog, there are some people coming here via the article. Here I would like to point out two things. One correction: Hikashu made their US debut in 2005. In the year they performed at the Stone in New York City. Not this year. And the other: I have some disagreement that Hikashu being labeled as "techno-pop." (Sorry for being so sensitive, but this is a fan blog after all.) Let me explain this. Which bands do you associate with Japanese techno-pop? I'd say, P-Model, Polysics, and Yellow Magic Orchestra. Nope, I have nothing against them. Nor I don't want to alienate the fans of those bands, neither (In fact, many of them is also the hikashu's audience). I just think that putting the band with them in the seemingly rigid genre is no longer valid. Very broad term like J-Pop is okay, but techno-pop is not. I've long held that they're out here, the latent audience for Hikashu, the undiscovered audience for them. I'm convinced there is a broader audience for their music, especially outside Japan. That's why I started this blog. I just wanted to fill the gap. And in my opinion, the possible audience is no longer in the so-called Techno-pop vicinity, and labelling them as "techno-pop" might alienate such people. I fear that. Certainly, there was a period that Hikashu was commonly considered techno-pop and the band themselves accepted it. After all, they made a debut as a techno-pop act and became widely known as such. Having said that, I believe describing their current music is techno-pop is, again, somewhat misleading. I don't intend to make a definition of "techno-pop" here. That's beyond my capability. Instead, I restrict myself to indicate some element of the style. My understanding that techno music mainly uses pre-configured, steady rhythm. Contrary to that, the rhythm of Hikashu's live performance changes all the time, extend and contract as the collective thinks fit, like a jazz ensemble. Interplay, improvisation and spontaneity are the main elements of their performance. And I doubt most of so-called techno-pop fan generally enjoy such kind of thing. I hasten to add that it's not the problem right or wrong. It's just a matter of taste. In my opinion, it is only the first few years that Hikashu could be described as techno-pop. After that, they mutated themselves something else. Or maybe, in the first place, they have never been as such. Regarding Theremin, I don't think using that instrument means techno. It's the question how it is used. For example, listen to Makigami's solo album called "Moon Ether." It is an album only using his voice and theremin. And it's not techno, but very intimate, so humane music. Sorry being so picky. Dismiss it as just another mumbo-jumbo if offended. I have to admit myself being such a fan. So Hikashu is techno-pop, or not? I already expressed my answer here. How about you? Now it's your turn. Make a judgement for yourself, at the Japan Society. Go see them, and have fun!